Converter stations are required in both the UK and France to convert electricity from DC to AC. AC is used for transmitting electricity in the UK and France’s electricity grids, while DC is used for sending electricity along the subsea and underground cables because it is more efficient over large distances. Lovedean in Hampshire was identified as the optimal location for the UK converter station, taking into account a number of factors, including the capacity of the existing network. 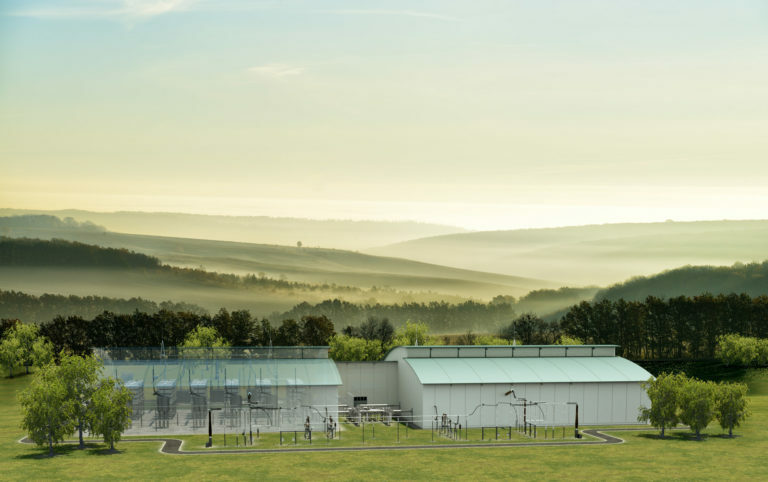 The converter station site will comprise a mix of buildings and outdoor electrical equipment, with the outdoor equipment being similar in nature to the equipment at the neighbouring Lovedean substation. The building roof line will vary in height, but will be approximately 22m at its peak. The design and layout of the converter station will be finalised in due course. It is anticipated that approximately 6-9 hectares of land will be procured for the converter stations in each country – this includes the areas designated for the converter station buildings, outdoor electrical equipment and any screening required. Work is being carried out to understand any environmental constraints (including ecological, landscape and heritage features), and develop appropriate mitigation. There are significant benefits in situating a converter station as close as possible to a substation. The AC cables used to connect HVDC converter stations to AC substations require more footprint and cause more disruption during the installation. AC cables also have higher transmission losses and pose other technical challenges.